The Chaplaincy Council members decided to donate funds to support the the refugee crisis in Hungary. The Council agreed to donate €500 via the Diocese in Europe chaplaincy based in Budapest, agreeing that they were in the best position to decide how to use the money. It is expected that financial and practical help will be required for sometime into the future. The following article has been taken from the Facebook page of Saint Margaret’s Anglican Episcopal Church. It should be noted that since this article was first written, the attitude of the Hungarian Government has hardened against the influx of refugees, mainly from Syria. NGO support is even more critical than before. 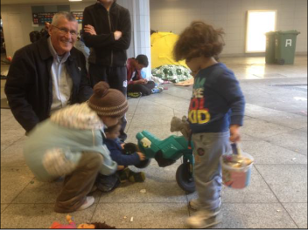 Moved by the plight of thousands of refugees traversing Hungary, members of Saint Margaret’s Anglican Episcopal Church in Budapest, Hungary – along with many friends of the parish -- gathered on Saturday, 5 September, to prepare aid-packets to be distributed among the refugees at the Keleti International Train Station. “There were about twenty-five to thirty of us in all,” reports the Rev. Dr. Frank Hegedűs, the local chaplain and area dean. “Everyone was enthusiastic and eager to help. 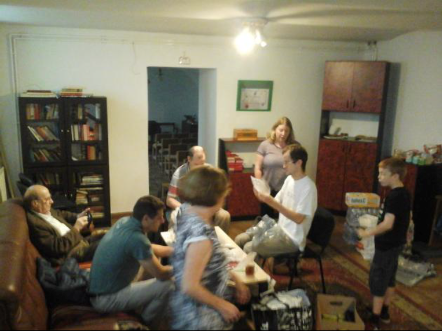 After prayer together and trips to local shops and stores to gather appropriate provisions, the volunteers put together approximately one hundred and thirty packets, or bags, containing fruit, nutrition bars, water, toiletries, and hygiene items, among much else. A member of Saint Margaret’s with extensive orchards in western Hungary also donated four hundred kilos of the autumn apple harvest to the effort. “I was happy to help,” observes orchard owner and Saint Margaret’s Council member, Arthur Reynolds. 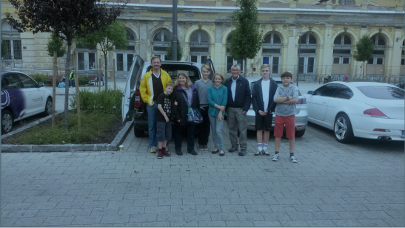 When the aid packets were prepared and ready to go, the team then headed over to Keleti station, a short distance from the church, to distribute the items. Keleti is not unlike any major train station in Europe – always bustling. On this occasion, the plaza in front of the station – as well as the modern underground transportation level – was filled with arriving refugees, mainly from Syria but also Afghanistan and other lands. The refugees appeared well dressed and groomed, though also obviously exhausted from their journey. Several reported being Christian. The language barrier was sadly formidable, but there was absolutely no sign of violence or disturbance anywhere. Police presence was minimal and respectful. The Saint Margaret’s team targeted mainly the many family groups in the distribution of their packets. Children and young families were everywhere. There are many fine charities, which will be doing their best to assist the refugees now and in the days ahead. Indeed, it sometimes seems after an issue has left the front-pages that the need becomes greatest. If friends near and far would like to make a contribution to on-going efforts on behalf of the refugees, Saint Margaret’s will be happy to serve as conduit for their donations. A smaller group of Saint Margaret volunteers is pictured, left, hard at work.